A recent survey of more than 2000 parents revealed a whopping two-thirds of children wear shoes that are the wrong size, which could put them at risk of foot deformities and other serious health issues. 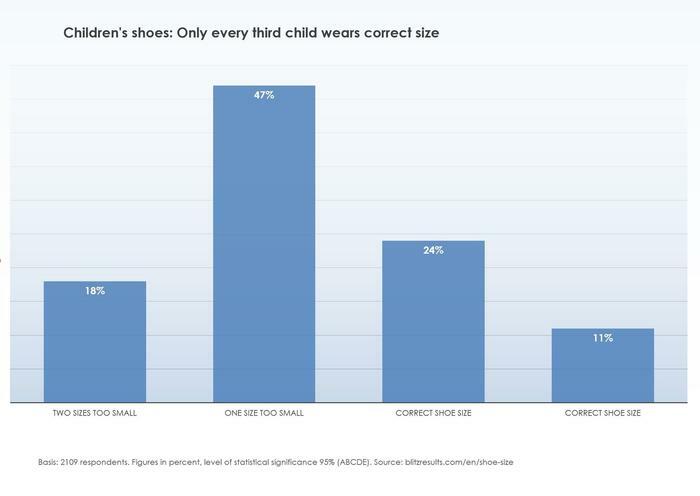 What’s more, the survey indicated that 47 percent of respondents’ children are one size too small and 18 percent are two sizes too small. Experts say wearing shoes that are too small could lead to foot and posture problems for children later in life. Since children are constantly growing, parents may rely on their child to ask for bigger shoes or simply go on traditional sizing options, which experts discourage. The study found that more than half of parents (52 percent) had never measured the length of their child’s feet before. Most parents, instead, tended to rely solely on sensorial and visual tests. Shoes that don’t fit properly can cause a foot deformity called hallux valgus, which occurs when the big toe begins to angle sideways toward the second toe, causing a swollen and painful bump or bunion on the side of the foot just below the big toe. Hallux valgus angles are considered normal when equal to or less than 15 degrees. But a 2009 study found that 3.3 percent of children who wore ill-fitting footwear had an angle of more than 15 degrees; 26 percent had an angle of 10 to 15 degrees. Never blindly rely on shoe sizes. Because there is no mandatory industry standard for shoe sizing, brands’ sizing will vary somewhat. Additionally, it’s wise to check the size stamped inside the actual shoe, not the box. Go by the longer foot. The right and left foot can differ in length by up to half an inch, which is almost an entire shoe size. Parents should always be guided by the longer foot when buying shoes. Give feet space. For kids to be able to properly roll through their feet when walking, experts advise that the tip of a child’s big toe should land about ½ an inch from the shoe’s inside tip while standing. Check your child’s shoes regularly. Every month or so, check to see if your child’s shoes still fit. “Since the sense of touch is not yet fully developed in children, children tend to squeeze their feet into shoes that are much too small–without even noticing it,” says Tim Lilling, expert at blitzresults.com. Measure the foot often. In addition to checking shoes, measure the foot often and adjust shoes accordingly. Signs that your child’s shoes no longer fit include: the greater toe hitting the front of the shoe, redness around the foot, and reports of pain. In the case of leather shoes, the material may start to bulge on the sides.